Is there a firmware upgrade for the Macbook6,1 from MB61.00C8.B00 to B02? This question is directly relevant to my failing attempts to upgrade the RAM in a Late 2009 White Unibody MacBook (MacBook6,1) to 8GB, and the question may be better asked in that context. 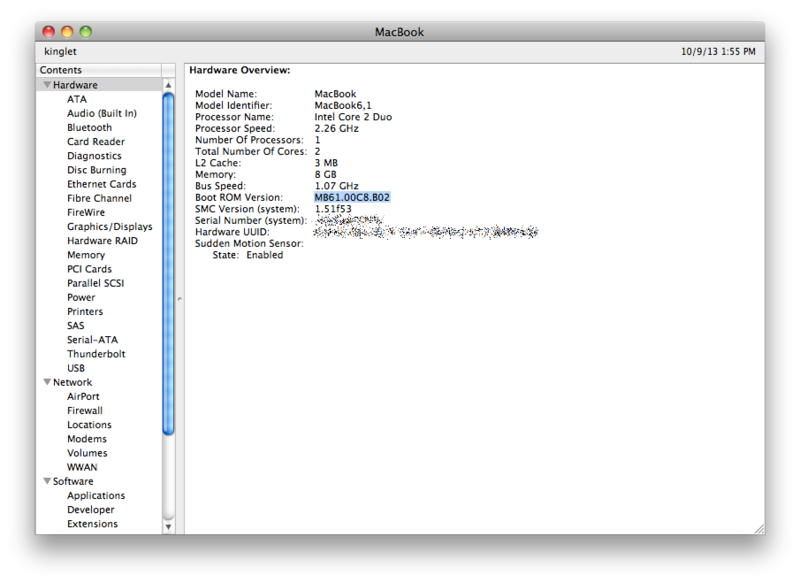 It is widely referenced (most authoritatively on everymac.com) that this model can support 8GB (despite Apple saying the max is 4GB), but in the "System Information: Hardware Overview" screenshots of every successful upgrade, the Boot ROM Version is shown as MB61.00C8.B02 while mine is at MB61.00C8.B00. While it's possible that I got bad RAM, I'm wondering if the earlier firmware version doesn't support 8GB. I did find one other person on a forum with the B00 firmware having the same problem I am ("3 beeps and won't boot with the RAM installed"), but no resolution; he did RMA his RAM at least once. Apple doesn't show any firmware updates at all for the MacBook6,1 model, so there's nothing official for me to try and re-flash. Has anyone managed to get 8GB working under B00, or upgrade it to B02? My 6,1 B02 has 8G RAM and works fine. It also runs in 64 bit mode, which I enabled some time ago with the help of a simple hack (can't remember all the details, just google macbook, 64-bit, boot.efi, boot64.efi). BTW: By doing this, you will probably also fix the MCP79 bug that makes MCP79 negotiate SATA1 with newer SATA3 drives (instead of SATA2). Note, that with 8G RAM, hibernation ("safe sleep"?) will make WindowServer crash if you're still running 10.6 (Snow Leopard). How to apply firmware without macOS?